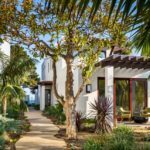 Perhaps the first time you heard of a pergola or saw one, it was a wooden pergola design being used to cover a walkway with some vines growing over it. These are also sometimes known as garden arbors. 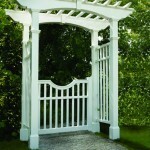 You may have attended a ceremony in a garden where a wedding pergola was built just for the occasion. 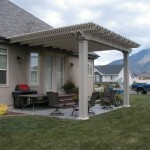 There are many attached pergola designs that create a more elegant looking patio cover or shade arbor. You can learn more on how to build one here. 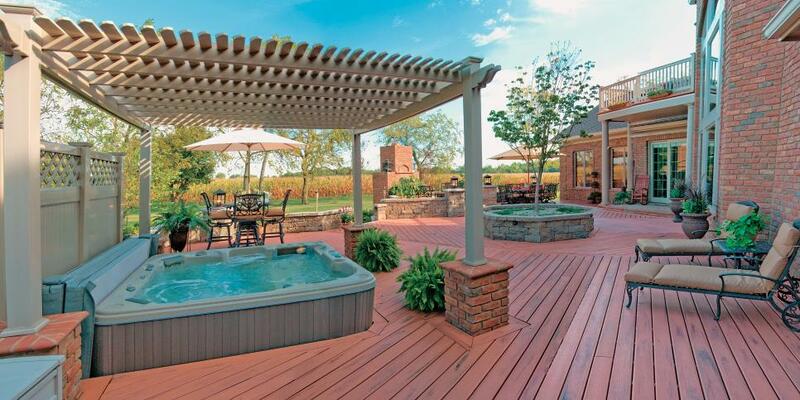 Detached or free standing pergolas can be put to many uses. 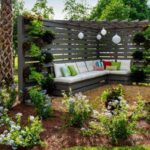 These outdoor pergola designs can be used to create a simple sitting area in a large yard to break up space and add some style and functionality. 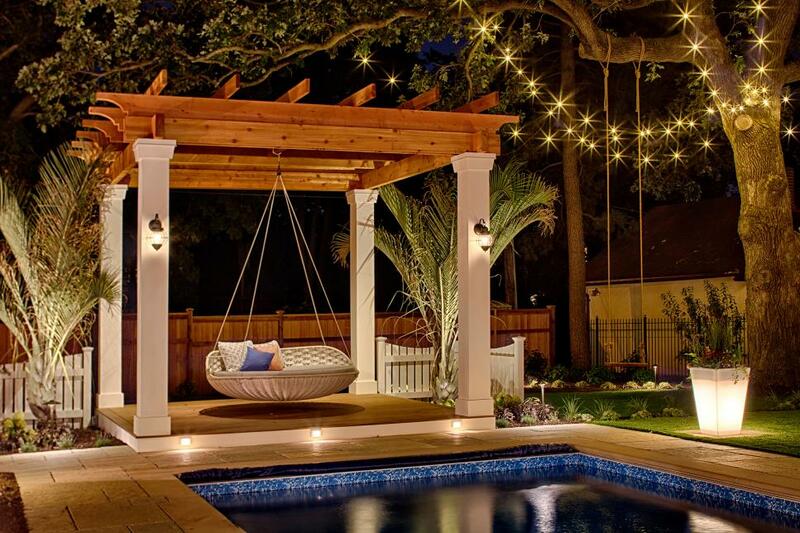 Perhaps you would like to able to relax and enjoy the shade and swing in the breeze. 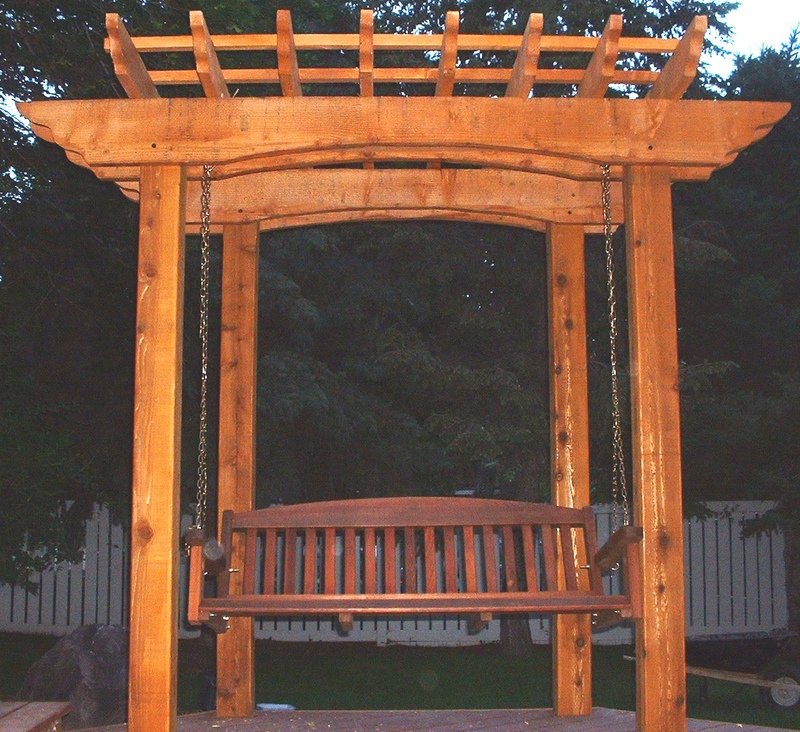 Yes, you can hang a pergola swing from the roof with proper structural support. You are not limited to straight lines either. 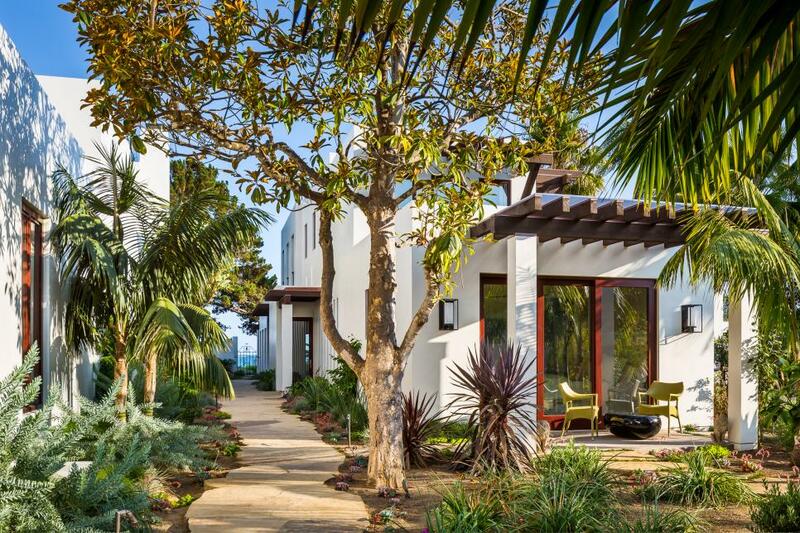 Many contemporary pergola designs incorporate curves to provide a softer, more graceful line. 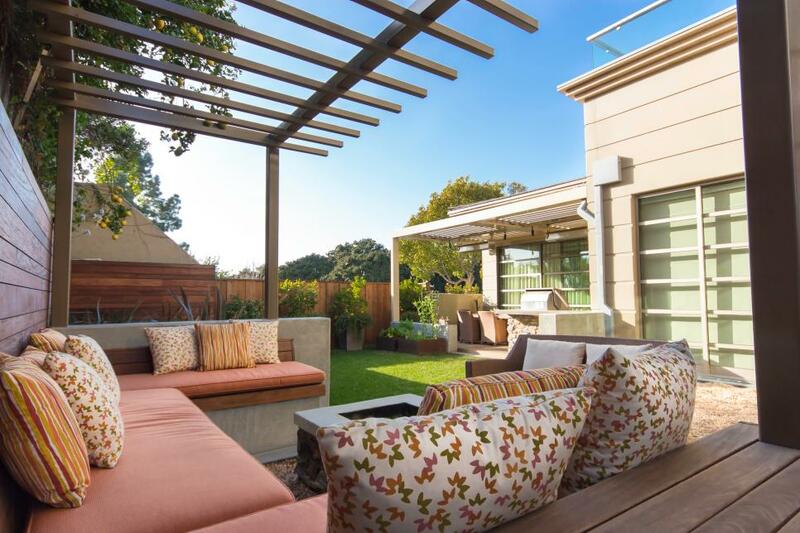 How would you like to have a complete outdoor kitchen and dining room in your yard? There is a design to fulfill that desire of course! 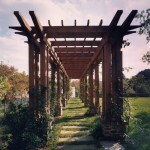 Many examples you will see of pergolas will be made of varieties of wood. 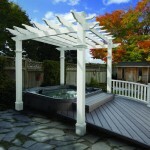 Pressure treated pine and cedar pergolas are the most popular. Wood and can be stained or painted in various colors to create the exact look you want. 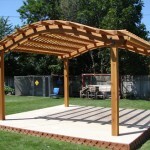 As another option, you could choose a vinyl pergola. 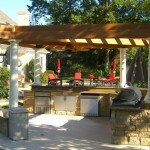 This could be advantageous should you decide to use a pergola as a covered patio for a spa for instance. If you want a sitting area or decorative display at the edge of a pool just take a look at this beautiful design. You can build it with wood or with vinyl. The advantage to vinyl is that it will hold up longer under the repeated exposure to moisture and it requires no maintenance, just washing. 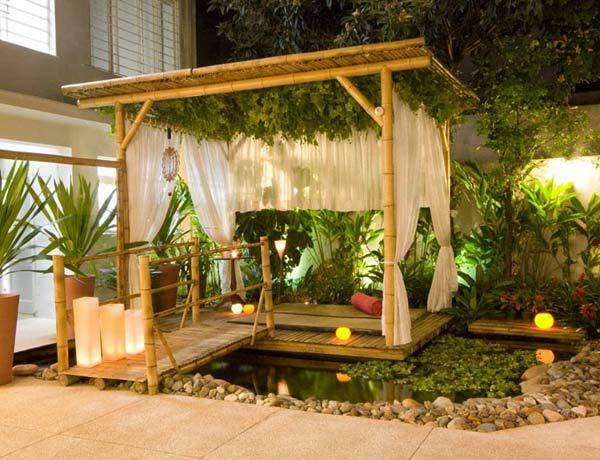 This is a great idea to take advantage of a not so big available space creating an intimate mood. 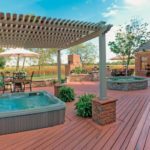 The pergola serves as a mild protection for you and the hot tub so the sunlight does not hit it directly and you can build a small wall on either side to keep it private while still enjoying the view. 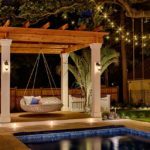 Expand the space of your house adding a beautiful pergola equipped with a central fire pit to stay warm during cold nights and with comfortable and stylish seats with their cushions and pillows. 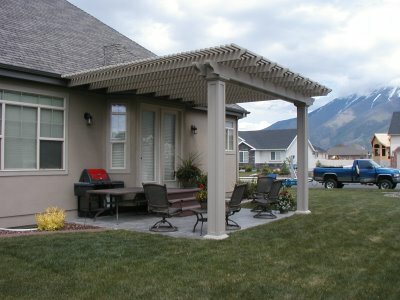 Pergolas can be used too to embellish and protect existing features of your house. 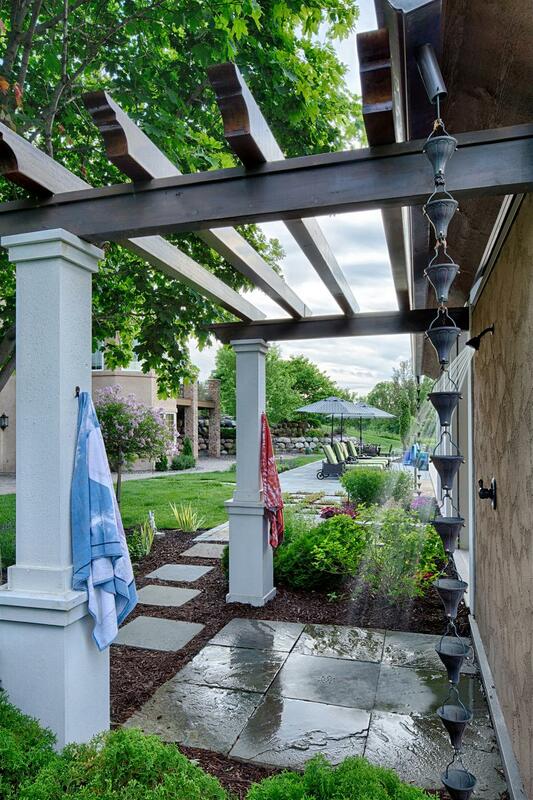 Take as an example this pergola made to block the sunlight from reflecting directly upon the glass doors of the entrance, providing an extra space in front of the doors in a stylish and useful manner. A perfect addition to your poolside that will delight your guests. 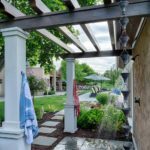 A pergola shower will make your house stand out from the rest and add some style to the process of rinse off after a swim and keeps your house without water because your guests don’t need to go in there to rinse. 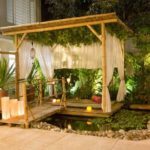 Another material that can be used to make your pergola totally different is replacing the wood with bamboo. 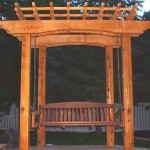 This provides a rustic look and feel to your pergola, blending more with the nature around it in your garden. This is an awesome place to spend an afternoon with your family and friends surrounded by nature. 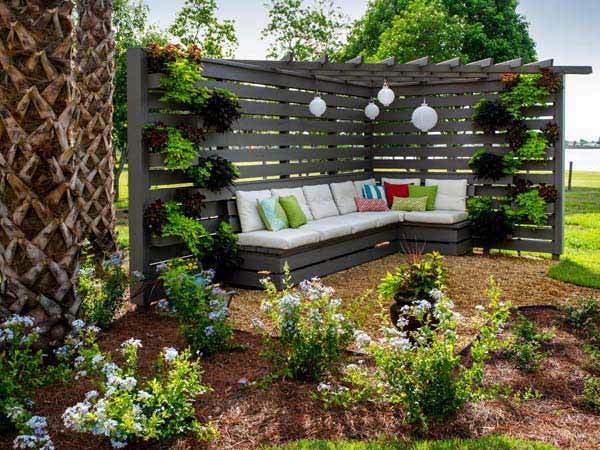 Find a place in your garden where you can set this up with a wooden wall where you can place the planters and the couches and add little details such as lighting hanging from the roof. 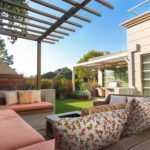 Besides wood and vinyl, fiberglass pergolas are also gaining in popularity though that tends to be a more expensive material. It does provide a unique finish. 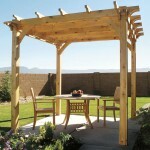 Fiberglass is also best used by purchasing one of the many pergola kits available. 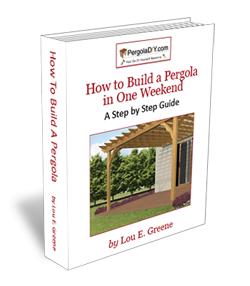 All other material options though can easily be used in a pergola DIY project first by getting some free pergola plans and then by getting a guide on how to build a pergola. 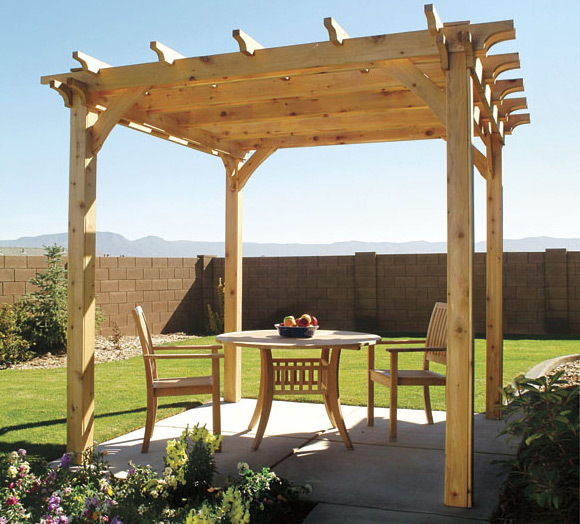 The best route to take is first to choose where you want your pergola. Then determine how you will be using it. That typically helps you to figure out the shape and size that you need. Then you can move on to selecting the exact material that will fit in with the first two requirements. And then, once you have determined what you want, you get to choose exactly how you want to do it!